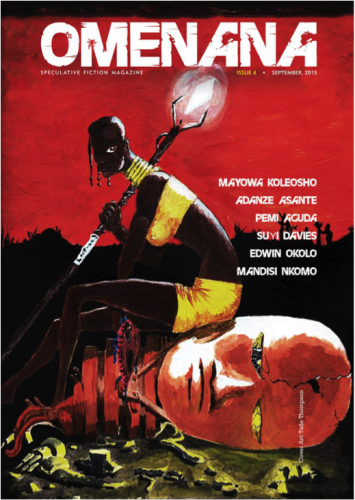 This issue features a story by Tendai Huchu, “Host Bods”, which anticipates the same basic story as the movie Get Out, by some years. The first issue started out with “name” authors. Mazi: “We [Mazi and co-founder Chinelo Onwualu] were contributors together with Tendai in AfroSF. So there was one time that Ivor [Hartmann] wanted every contributor to AfroSF to have an interaction, so he sent everyone an email, with every contributor copied in. “Chinelo remembered that, so we could pitch Omenana to people who were in AfroSF. That was how Tendai Huchu sent us a story. It was free, it was new, it was just us talking about it, and we wanted to do this. Also the [AfroSF] Facebook group was helping. So there was a bit of a buzz that something like Omenana was about to come out. “So we got stories from Tendai, Saratu Abiola, Rafeeat Aliyu, Oluwole Talabi. Now Wole. That was like his first major exposure. I’d not read him before that. Well, I would say it was new, rather than big. (Laughs). “Saratu Abiola is the daughter of an important politician, M.K. Abiola, one of the people important in the events of June 12 [the military government of General Ibrahim Babangida annuled the presidential election of June 12 1993, largely believed to have been won by M.K.O. Abiola who later died in prison]. She’s very popular on Twitter, but she doesn’t add her surname. Her story was based on the idea of winter in Lagos. What happens if you wake up one day and it’s winter in Lagos? I really liked the story and I expected to hear more from her spec-fic-wise, but so far we have not had another story from her. She’s based in Abuja, I think. Chinelo knows her. “Somehow it was picked up in the US and became very big, getting upwards of a thousand hits. Comments kept coming and coming and people were looking for it. ‘I’m a fan, I’m African, but I go to these cons, I don’t see anybody or anything that leads back to my heritage.’ It was a big deal; even in the Nigerian context people liked this essay. People just took notice. Mazi: “That came out four months later after issue one. We initially thought we would do monthly. But we were very busy. It’s so difficult to sit down and do it. If this were all we do, then we would have a monthly publication. But now we have to do other jobs to get money for it, it’s crazy difficult. I mention to Mazi that Chinelo frequently talks about “Monkey House” by Tade Thompson being one of her favourite Omenana stories, and also ‘Story Story’ by Chikodili Emelumadu. Mazi: “Chikodili Emelumadu was in the USA [in 2016]. She was one of the most excited people about it, when the Omenana first came out. She was ecstatic about it on Twitter and Facebook. “I didn’t know we went to school together. One of her best friends was a friend of mine. We didn’t know we knew each other until we were talking about school. I was studying linguistics. She was in English. Mazi: “Another issue where we had loads of stories. When we did issue two the question wasn’t so much quality. The people were already in the community of established writers, so the stories were quite strong. “But for issue three we had loads of stories from new writers. It took a long time to get to the stories we wanted and then working with the writers to get each story to be as good as it could be. The work got harder. These were people who were experimenting, who had never done it before. “We didn’t want it be a magazine that would just cater for the same names over and over. So we thought let’s work with these younger guys because that was the idea. To give space for people who are up and coming. “Issue three, you’ll find we have new names. Dr Abdulrehman, he’s Tanzanian. He wrote a story about a djinn for us. The djinn is in love with a lady but he can’t get physical because he’s always very hot so he’ll burn her. We did a lot of work on this story with him. He was very cool about being edited. He’s very very good and we wanted voices from that part of Africa. We didn’t want it to be just a Nigerian magazine. I mention how innovative I found “A Short History of Migration in Five Fragments of You” by Wole Talabi. Mazi: “Wole actually sent a short version of it for issue two, but we loved it so much that we asked if it could be longer, and he sent it back for issue three and it was incredible. Mazi: “This issue had Mayowa Koleosho, who we haven’t heard from again. It had Adanze Asante. This was the edition we said, no known names. Let’s go for fresh voices. “Among this set, the only name I’d heard of before was ‘Pemi Aguda. I’d met Edwin Okolo at the Farafina workshop. What I do is every edition of the Farafina workshop I go to talk to them about speculative fiction. I tell them that we have this website, and how I would have felt if there was a place I could send fiction to. Edwin was one person we got from the workshop. ‘Pemi Aguda, Suyi Davies, Mandisi Nkomo, and Edwin Okolo have all gone on to publish elsewhere. 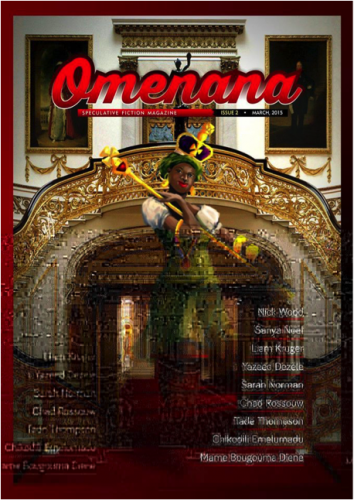 By issue four, Omenana was generating a second wave of writers that would become well known at least within the field. Mazi: “This was Suyi Davies’s first story that he sent to us. It was very crude but we worked on it. Suyi is like super nice and very very good now. He’s gotten so big between that time and now. Compared to his story that we worked on for the new edition [‘Of Tarts and New Beginnings Omenana,’ November 2016], the growth has been massive. “Mandisi Nkomo from South Africa later had a novella in AfroSFv2. This story is a hybrid of Tolkien and South African history. “This was the one edition where we didn’t have any money for art, we had to go online to look for images that related to the story. So we found them, but they are not out of copyright. We can’t sell the magazine with those images. They are allowed because they are free. “Even the cover. Tade Thompson painted it. He had given us this art when we did the callout for Omenana One. We asked, ‘can we use for the cover of this issue?’ He said fine. It worked, it worked beautifully. “From issue one on, people could download the whole magazine as a PDF and it looked like a physical magazine. People liked that it doesn’t look like Kindle. We did it for all the issues. And that comes from the fact that I’d done some physical magazines, I’ve done some online magazines. So I got a designer in who I’d worked with before and he designed it like a physical magazine. “After we did issue four there was the issue of money. It was difficult. I had issues with my family, so I had spent money and didn’t have money to run the magazine. “The Goethe-Institut approached us and asked us to do an edition for them, for the African Futures project. They said they would give us three hundred thousand naira [very roughly a thousand US dollars]. It was big money. “We don’t do this for the money. So we thought: how do we split this money? So we thought OK, ten flash fictions and each of the writers get eight to ten thousand naira. Each of the flash fictions is going to have an Art with it. The artists are going to get ten thousand naira. That is two hundred thousand. So we are going to use the hundred thousand to do the design of the magazine. “We did a call out, got loads of people sending in stuff, did the shortlist, worked with the writers, and at the end of the day selected ten. Not all of the artists turned out their work on time. That was when we met one guy who has stayed with us since then, Sunny Efemina. “Sunny came in and within two days he was able to fill in for all those artists who didn’t send in their work. We had our edition. We didn’t want to call it Omenana Five because it was for something special, something different. But it was Omenana Five. “We got a lot of new people. For example IfeOluwa Nihinlola, that was his first story for us. Seun Odukoya ... I’ve known Seun for a long time. He’s always been there. Niyi Ademoroti, we never heard from him again after this. Even Abdul Saataar. I loved his story ‘The Golden Child.’ A lot of them just disappeared. 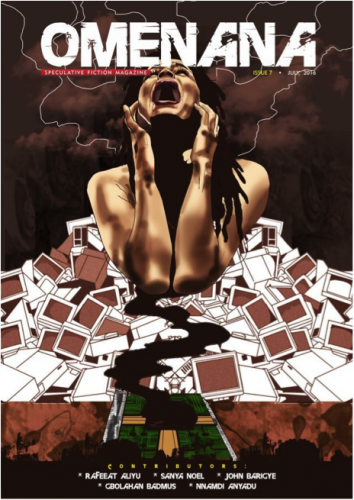 The issue also contained work by other previously published authors like Rafeeat Aliyu, Biram Mboob, and Amatesiro Dore. Mazi: “It was our first story from Amatesiro Dore, but I’ve known him for a long time. “He’s not necessarily spec fic. But he’s moving into it. I’m surprised because I was at a workshop with him. I was about the only person talking about science fiction. He seemed to me to be more interested in literary fiction. “That was Farafina 2012. For the first few days, it was Chimimanda who was teaching so it was all literary fiction and I was there and feeling so lost. I couldn’t find my place in that landscape they were painting. I’ve not read Kafka. Which I’ve intended to do, but I’ve not. I’ve done Stephen King; I’ve done Anne McCaffrey. But I’d not done these names they were calling. 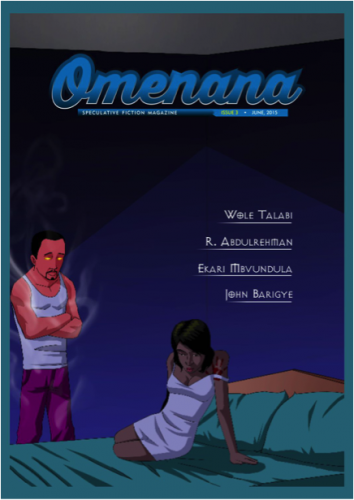 “Stories for Omenana X had to be set in a future African city because it was for the African Futures project. I did like that it was diverse. The story Amatesiro sent us was about homosexual relationships. I didn’t know he was gay until two months ago, and I’ve known him for years. It was about a marriage between two guys, but the problems they faced were so much like what a heterosexual marriage would face now. We start to discuss pan-Africanism and how so much African SFF shows a pan-African future. Mazi: “I initially did that pan-African stuff a lot. It’s an ideology. It’s something you get, people talk about it. Kwame Nkrumah, ‘Africa should be one.’ Gaddafi was all big about it. You are looking at this utopia in the future in which Africa is one big happy country. But in our own countries we know, it’s almost impossible for Nigerians. The future is going to be worse than it is today. “The Goethe-Institut wanted the issue to be printed. I said that the money they gave us was not enough. If they wanted it printed, that was up to them. Mazi: “So for six, we decided we were going to keep paying. “The money comes from my pocket, basically. If we pay people we can tell them what to do with their story (Laughs). There are a couple of people we have not been able to get the money to. Tendai said we should keep his money. “Relme Divingu is a French-speaking writer. We kept asking him for a biography and he never did send it to us. Our policy is when you send us a story, send a bio and a photograph. We liked the story so much we just took it. 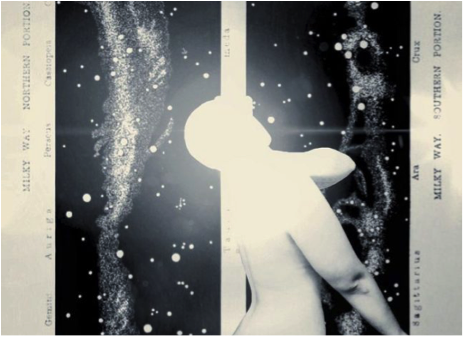 Mazi: “For issue seven we asked Sunny Efemena to do whatever he wants. He did all the artwork. That started the tradition where the artist who we interview would provide the art for the edition. The cover is a lady screaming. I liked it so we had it for the cover. “This particular issue, what I loved about it was the mix of stories. 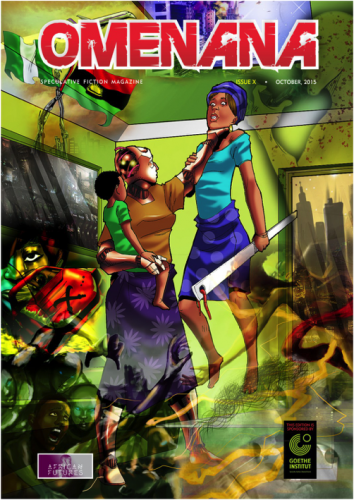 This issue had ‘Sweet like Paw Paw’ by Rafeeat Aliyu. Rafeeat is becoming family. We know she’s going to take something traditional and give it a very modern twist. “I love the Nnamdi Anyadu story so much. We really liked this idea. We always have this story of man discovering mythic beasts or beings. This is mankind being discovered by aliens. I met Nnamdi at the Farafina workshop. I tell them, just because I’ve come here and talked to you about submitting stories to us doesn’t mean we’ll accept your story. It has to be good. “This issue has John Barigye again. His story ‘Potency’ is about a difficult subject, male impotency. It’s also a superhero story. Why is that when we do comic books we have guys in spandex? Why don’t we do stuff that is common to our environment? ‘Potency’ is about this guy who has powers to move things. He doesn’t have to wear a cape or a hood. I loved the company where the guy worked. It was futuristic but everyday. “Gbolahan Badmus—I’ve known him for a while, mostly on Facebook. But this is the first time I’ve seen him do speculative fiction. I actually loved this story. I love the idea, and the element of horror. “In this one, we had another story from Wole Talabi, who is becoming a regular, while also selling his stories to magazines abroad. “We had a story from Suyi Davies, the one about food, which is about my best in the edition. I love this story. Why I was so touched by this story? It’s like he had read the stuff I’d said online. You don’t have to set your stuff in a village. It doesn’t have to be about a witch. This was a very traditional subject; it’s something we hear a lot about. You hear of a popular restaurant, the story is that there must have been some juju, something in the food. “The heroine of the story can cook so well because she sees scent as colour. Aromas for her are colours. So if it’s this blue, it needs more salt and if she puts salt, it becomes a darker shade of blue. It was an auto accident that gave her this heightened sense. 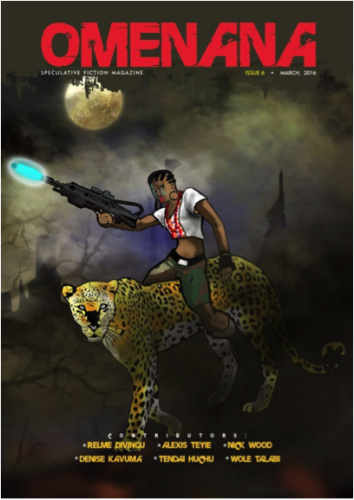 “The growth from Suyi’s first story—it’s amazing how far he has grown as a writer. I see him everywhere now, not just in Omenana. “The field is growing too. It’s taking off. I remember when it was hard to find or read speculative fiction.